It began with an intriguing map tumbling out of the Los Angeles Times in October 1997. Like a map to hidden pirate treasure, it showed the way to an adventure that would become one of my most memorable days. It took until April 2000 for me to finally set my wheels upon the route, but after two and a half years of procrastination and planning, I can finally say, I drove the Ridge Route. But its more than that, I drove it sixty seven-years after it was effectively abandoned. So whats so special about a narrow road tracing the mountain ridges between Castaic in the South, and Gorman in the North? The Interstate 5 can cover the distance in a matter of minutes, why would anyone want to average eight miles-per-hour and twist around in circles for half a day, just to cover the same distance? The fact that its a road thats hardly been used since the days of wooden wheels and solid tires is enough. But the unexpected solitude and beauty to be found up there in the twenty-first century, as history unravels beneath your tires makes the route really magic. I will refer to reference sources later in this article, which contain expertise that I cannot hope to rival. But it is my own experience up on the ridges that will always stay in my memory. In the early part of the twentieth century, there was a lot of talk about dividing California into two states. The division would have been North of Los Angeles. It was extremely time consuming to travel from the Antelope Valley in the North, to Newhall and then to San Fernando in the South. Detours had to be made way out to the East. Western California was essentially two worlds. Because of the swift rise of the numbers of cars and trucks, it was decided that a shorter vehicle route between the North and South should be built. Technology at the time really wasn’t up to blasting and tunneling too much earth away, so roads had to do what horses and wagons did, they followed the contour of the land in order to avoid extreme gradients. This meant twists and turns and narrow ridges atop steep cliffs. What finally resulted was a wild low-speed ride as thrilling as any roller coaster of the day. Oiled and graded in 1915, and later surfaced with reinforced concrete in 1919, a narrow strip of concrete twisting across the mountaintops. 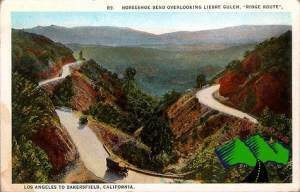 And, mostly because of the existence of this new road, California remained as one State, from Oregon to Mexico. I cannot do justice to the fascinating history of this road, but I will provide links at the end of this article that, if followed, will haunt your imagination until you finally get yourself up there and experience this magical road. Only one of my friends shared my interest in tackling the route, and after a couple of years we finally did it. We wanted to wait until after a long dry spell, because we knew that rain could make the road extremely dangerous, and that any kind of car problem could lead to a life-threatening situation. My friend Michael (seen in my pictures) called the Ridge Route Museum in early April 2000, and a helpful Ridgerouter explained that the recent rain had deposited snow up on the route, but within a few days, the high temperatures had melted it all away. This un-named man re-assured us that he drove the route often, in a Saturn sedan, so we wouldn’t have to go and rent that four-wheel-drive truck after all. I drove my 1995 Neon. A Neon, an Englishman and a New Yorker. With temperatures in the nineties, we pulled off the 5 North, armed with print outs from Mike Ballards web-site and Ridgeroute.com (links to follow.) 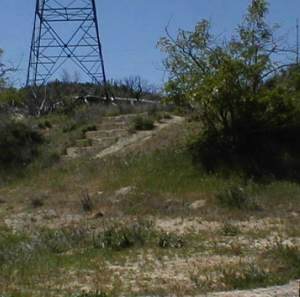 Passing through Castaic, the road signs proclaimed that we were on Ridge Route Road, our pathway to Avalon. We crossed Lake Hughes Road and wound through the brand new houses, aware that those very houses had diverted us from the authentic alignment of the old road. The detour took us up a hill so steep that the front drive wheels of the Neon began to slip, and we were barely out of town! Straight away, though, the views began to present themselves. This was Southern California, wild and beautiful. So far, the old concrete we had longed to see for so long was well buried beneath the asphalt, and there was not a sign in sight to re-assure us we were actually on the Ridge Route. And then suddenly we passed the boundary of County road maintenance. Here, just an inch underneath the crumbling asphalt was the winding strip of narrow concrete we had so longed to see, with the insides of the curves filled in for safer views around the bends. Up we climbed with Castaic Lake making an appearance far below off the right side of the road. It was hot and silent. When I turned off the engine for a photo stop, there was no sound in my ears except for my own bloodstream and the occasional flying insect. And then the concrete reappeared. A surface poured by roadway pioneers. The Neon bounced along admirably in low gear at speeds ranging from three to ten miles per hour. Crossing Templin Highway, the signs ahead proclaimed No Through Road. We considered that we might not be able to complete the mission. We might get almost all the way through and have to turn around and come all the way back! Onward stout Neon. We knew we were passing the foundations of places that no longer existed without a hope of noticing them, but it was easy not to miss the steps to an old gas station called the National Forest Inn. How excited we were so see these steps. Ordinary concrete steps in the middle of nowhere! But we could feel something, they were significant because we had seen them in the pictures from the web sites, and now we could climb up them. 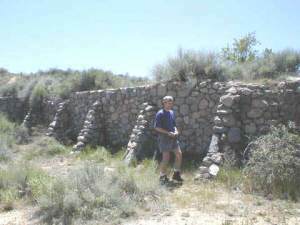 Man made historical features in the wilderness. 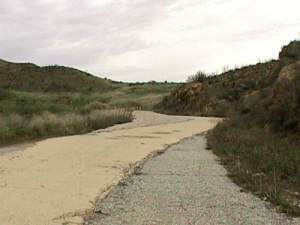 If not for the Ridge Route, humans might never have placed a foot on this spot, but thousands did between 1915 and 1933. They bought gasoline and coffee here. They even spent the night in clapboard cabins on this spot. We failed to identify any more foundations for miles, but we did spot a few we could not attach names to. There were a handful of people around in trucks, working on gas pipelines and power cables and transmission towers, but for the most part we were just driving alone through ancient postcard vistas. The only ugliness in all of this beauty was due to gas and power. Pipes stretch over and under the twisting road with no consideration for their appearance. Colored painted symbols desecrated the very historic concrete, pointing technicians to various piles and wires. But the sheer natural beauty of the place and the sculpture of the road itself easily overwhelmed this ugliness. I had to swerve in slow motion past boulders that traveled 2 miles per hour slower than my car, (they werent moving, and I drove at 2MPH.) At one stage a huge landslide had almost completely blocked the road and I had to put my right wheels up it and crawl past at snail speed and a thirty-degree list. Forces of nature are powerful, especially the force of water over long period of time. In places where water naturally crossed the road, the original concrete and the subsequent repairs had succumbed and the Neon had to gingerly stumble over the resulting gaps. It brought to mind the clichéd rope bridge over the Amazon gorge. Fedora wearing explorers falling through the planks and almost slipping away into thin air. 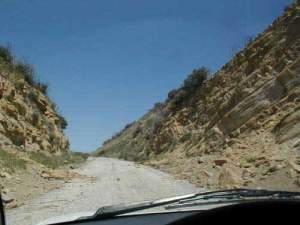 When we reached the section nicknamed Serpentine Drive we found the smoothest remaining concrete on the route. The concrete was banked into the curves, which meant that it had better drainage, which in turn meant that water had less chance to erode it. Here I allowed the car to speed up to 15MPH for a moment, and felt what it must have been like to use the road when it was in its prime. Climbing up to the next section and looking back down to Serpentine Drive, we were able to match the view with the image from one of the ancient postcards. The next treat was Swedes Cut, a cutting through soft rock, which has always produced rockslides. Michael was a little nervous as we drove slowly through the debris field and stopped for photographs. At any moment, another man-sized rock could decide to join us down on the roadway. 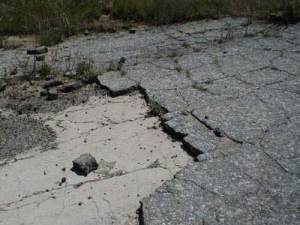 In many places on the Ridge Route, I observed that the bumpiness, which makes it so difficult to drive on, is caused not by the state of the original 1919 concrete, but by the eroded softer asphalt, which had been used to improve it. Wherever it was visible, the original concrete surface was in better shape than the sections that had been re-surfaced. 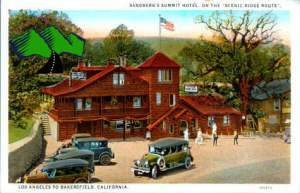 We stopped at the easily recognizable foundations of the Tumble Inn and re-read the history of the establishment from our notes. Shotgun cartridges littered the foundation. The cartridges were in every color of the plastic rainbow. Winding down to Sandbergs, we squinted to imagine the fine structure, which had once stood there. And then the concrete slid below smooth blacktop again as we re-entered the county maintained section of road. Spectacular views of the Antelope Valley lay ahead. Jumping west to the 5, we covered the same distance southbound in a few minutes that had taken hours northbound on the Ridge Route. We shot down the hill at eighty-five miles an hour and were passed by a giant cat doing a hundred. It was the Meow-Mix truck. We had done it. Thirty months and a few hours were all it took to change our outlook on Southern California. 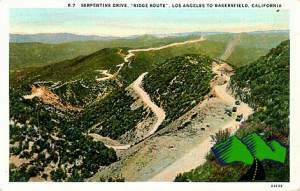 Michael is seeking original postcards of the Ridge Route for his collection. Historian Mike Ballard created a web site that really is a virtual tour of the Ridge Route. If you are not able to experience the Ridge Route in person, this site is the next best thing. The official site is equally excellent, and contains a stories link with three must-read articles. The article from The California Historian is particularly interesting. Pictures of many old postcards can be seen on the various pages on this site, and it is these postcards which offer us a glimpse of what it must have looked like when this road was the only direct way to get from North to South. http://www.ridgeroute.com/ Surf to every page! Jeffrey the Barak is the founder and publisher of the-vu. This is the oldest article. NextNext post: Is there such a word as Muralist? It was great reading this about the Ridge Route. I had forgotten about the trip, it has been a while. 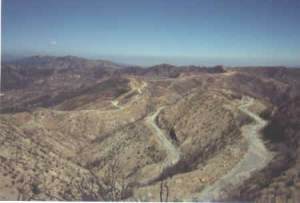 My tour is still online, with updates – http://socalregion.com/highways/ridge_route/ . The RidgeRoute.Com site, however, is not mine. It is run by Harrison Scott of Torrance, CA. WordPress may be free, but it is among the best ways to publish.